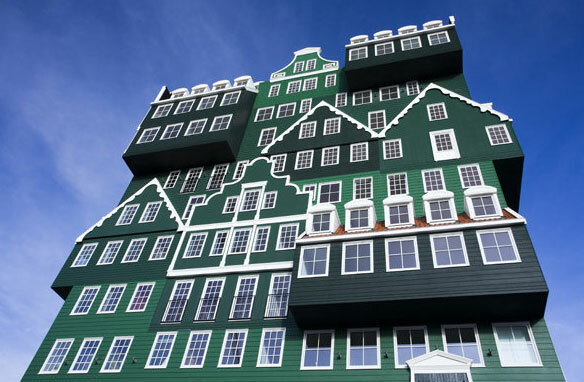 This is a new hotel in Zaandam. The place where every tourist goes for the wooden shoes, windmills and other stuff and where the original Dutchmen doesn’t go, but that aside: this hotel is made of the original houses of Zaandam all built on eachother. Just like the architect says: “little, temporary houses”. And isn’t that what a hotel room is? Your little temperoray house when you’re on the road. But what do you think: is this kitschy touristic design or a beautiful example of how to make a tourist attraction into a modern landmark? I think the last.